Science of Computer Programming is dedicated to the distribution of research results in the areas of software systems development, use and maintenance, including the software aspects of hardware design. The journal has a wide scope ranging from the many facets of methodological foundations to the details of technical issues and the aspects of industrial practice. • Software aspects of infrastructure services, system administration, and network management. Special emphasis is given to recent trends in software development, such as software architecture, component-based software development and web-based software engineering. SCP is divided into four tracks. These are: (1) Concepts and methodology, (2) Formal techniques, (3) Experimental software technology, (4) Descriptive software technology. 1) The conceptual track is open for methodological, philosophical and sociological studies on all aspects of computer software production and usage, including ethics. Also short papers are allowed here, called viewpoints. 2) The formal track emphasizes the development and the pragmatic application of formal and semiformal techniques. Submissions which the editors consider mainly mathematical or theoretical in nature, with the preliminary consent of the authors, will formally be forwarded to the sister journal TCS. 3) The experimental track is open for expositions on implementations of and experiments with novel programming languages, systems and methods. It must be emphasized that papers describing new software tools of relevance to SCP are welcome under the strict condition that the source code of the tools is open. Moreover, the results should be reproducible and show general applicability. By means of the article type of original Software Publications also versioned software product, corpora and datasets can enter the review process and get published. 4) The descriptive track deals with observational studies of current software development practices, reporting on new languages, systems and methods, including survey reports on the various themes. 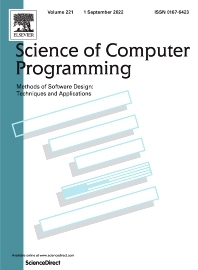 Science of Computer Programming welcomes Special Issues within its Scope either resulting from conferences or workshops or from dedicated editorial efforts.